One of the great modern debates stemming from the Old Testament concerns the fate of Noah’s Ark, which many believe to be located near the top of Turkey’s Mount Ararat. Time Life Pictures/Getty Images. Chapters 6–8 of the biblical book of Genesis tell the story of Noah and his family surviving a catastrophic flood inside of a great ship, the Ark, built and designed according to God’s instruction. For centuries this story was accepted as literal truth by most believers, but like other stories, modern biblical interpreters have called it into question. Among the objections are the seeming contradictions in the text itself, which many see as two different accounts of Noah that had been placed rather naively side by side. The stories differ on a number of points, including the number of animals taken into the Ark prior to the flood. One response to these objections has been to explore Mount Ararat, the mountain upon which the Ark ultimately came to rest when the floodwater receded. If the flood had actually happened, remnants of the Ark could be found buried in the ice high above the tree line on the mountain’s slope. Such a possibility was suggested by several people who attempted to launch expeditions to the top of Ararat in the mid-twentieth century. The location of Mount Ararat has presented a continuing problem. It is located in northeast Turkey, just ten miles west of the Iranian border and twenty miles south of Armenia. Prior to the fall of the Soviet Union, Armenia was one of the Soviet states. Expeditions to Ararat have tended to bring harassment by sensitivities of Turkish authorities to outsiders working so close to its borders. However, in spite of the mountain’s location, rumors of the Ark’s continued existence periodically surfaced. In 1955 a Frenchman named Fernand Navarra, who had previously visited the mountain on two occasions, announced the finding of a piece of wood showing human workmanship, discovered 13,750 feet up the side of the mountain. He brought a small piece of the wood when he returned from his expedition. In 1969 he and others found additional pieces of old wood at two different Ararat sites. He also subsequently wrote a book, Noah’s Ark: I Touched It, that was translated into a number of languages and further stimulated interest in the Ark. Unfortunately, when subjected to scientific testing, the samples of wood proved to be of relatively recent origin. It was even suggested that Navarra had planted wood on his earlier expeditions, then retrieved them at a later date. Meanwhile, in 1959 a Turkish pilot taking pictures to map the region photographed a ship-shaped object on another mountain some fifteen miles from Ararat. Various people who examined the photographs made increasingly interesting statements about the possibilities of the object, especially after Life magazine published the pictures in 1960. An organization called the Archaeological Research Foundation (ARF) mounted an expedition in the summer of 1960, concluding that the object was simply a natural anomaly—namely, a clay formation in the midst of a lava field. The ARF personnel found no manmade artifacts or wood. That seemed to put an end to any interest in the site. However, one person, Ron Wyatt, a Seventh-day Adventist from Madison, Tennessee, felt the ARF had been hasty in its conclusions. In 1977 he visited Turkey to investigate the abandoned site. Following his visit he wrote a thirty-six-page booklet with the confident title Noah’s Ark Found. Though possessed of no particular linguistic skills and unable to reach the disputed site on his first visit, he nevertheless claimed to have turned up a set of items that justified some rather startling conclusions. His purported findings included some stone sea anchors, petrified timbers from the Ark (discovered in an Armenian graveyard), a house built by Noah that included stones with inscriptions describing the flood, and Noah’s burial site. Over the next few years, the personable Wyatt convinced several notable people to take a second look at the site, including Apollo XV astronaut Col. Jim Irwin, Dr. John Morris, head of the Institute for Creation Research, and Marvin Steffins, president of International Expeditions. Amid hopeful claims of having found the true Ark, Wyatt went on to found Wyatt Archaeological Research and expand his searches for other biblical sites. He would later claim that he had discovered the location of Sodom and Gomorrah (two cities destroyed by God for their wickedness), the exact spot where the Hebrews crossed the Red Sea out of Egypt, and the burial place of the lost Ark of the Covenant below the spot where Jesus was crucified. Details concerning these claims now appear on the Wyatt Archaeological Research website. Along the way, he has lost the support of most of the scholars who had given early, tentative support, and few today take his claims seriously. Nonetheless, he continues to circulate several books and videos, especially items touting the ship-shaped structure he claims to be the true Ark. Meanwhile, a variety of efforts to locate the Ark continue at Mount Ararat and other nearby locations in the mountainous region. They have all been inconclusive to date. The discovery of an object that could verify the biblical story of Noah and the flood face considerable obstacles. Given both the dominant opinions concerning the story of the Ark and the importance of debates over biblical authority, any object bearing claims to date to Noah’s time would have to pass a battery of tests verifying its ancient status. At present, no object has met even preliminary qualifications. Amirault. “A Great Christian Scam.” Posted at http://www.tentmaker.org/Dew/Dew7/D7-AGreatChristian Scam.html. Accessed April 1, 2007. Bailey, Lloyd R. Noah: The Person and the Story in History and Tradition. Columbia: University of South Carolina Press, 1989. LaHaye, Tim, and John Morris. The Ark on Ararat. Nashville, TN: Thomas Nelson Inc. and Creation Life Publishers, 1976. Navarra, Fernand. Noah’s Ark: I Touched It. Gainesville, FL: Bridge-Logos Publishers, 1974. Wyatt Archeological Research. http://www.wyattmuseum.com/. Accessed April 1, 2007. Mount Ararat in Turkey is where Noah’s Ark supposedly rests, according to the CIA, though some scholars believe the actual location is somewhere in present-day Kurdistan. There is no question that the remains of Noah’s Ark can be found on Mount Ararat—and the CIA has the proof. So prevalent is the belief that Noah’s Ark can be located on the slope of the tallest mountain in Turkey, Agri Dagi (Mount Ararat), that some travel agencies include participation in expeditions to search for the ark as part of tour packages to Turkey. According to Genesis 6–10, God had become angered at the wickedness of humans and was determined “to end all flesh.” God called on Noah, whom he deemed a just man, and told him to build a large barge with three interior decks. The barge was to be constructed of wood and sealed with bitumen. Its length was to be 300 cubits (about 450 feet), its width 50 cubits (about 75 feet), and its height 30 cubits (about 45 feet). The ark, with Noah’s family and at least two animals from every species, would be able to survive the deluge through which God would wipe out all other life on earth. After seven months and seventeen days afloat, the ark came to rest upon the mountains of Ararat, near the headwaters of the Euphrates River in what is today eastern Turkey. Some biblical scholars locate the final resting place of the ark in Kurdistan, an area that encompasses Mount Ararat and parts of present-day Turkey and Iran. The Babylonian account of the deluge in the Epic of Gilgamesh names Mount Nisir in that region. Several ark sightings on Mount Ararat occurred during the twentieth century. During a thaw in the summer of 1916, a Russian Imperial Air Force lieutenant noticed a half-frozen lake in a gully on the side of Ararat. World War I was raging, and the Russian pilot was flying high-altitude tests to observe Turkish troop movements. Flying nearer to the lake, he saw half the hull of some sort of ship poking out above the surface. He reported it to his captain, who later joined him in a flight over the site. Believing it was Noah’s Ark, preserved because it was encased in ice most of the year, the captain sent a report to Tsar Nicholas II at Saint Petersburg. The tsar sent two corps of engineers up the mountain. It took nearly a month for the Russian engineers to reach the ark. They took measurements and made drawings and photographs, but none of those was ever officially documented. According to accounts, the photographs and reports were sent by courier to the attention of the tsar, but he apparently never received them. The Russian Revolution broke out in 1917, and the results of the investigation were never reported publicly. In 1959 the Turkish Air Force conducted an aerial survey of the Ararat region. A photograph revealed the outline of a ship on one of the lower slopes (just over 6,000 feet) of Mount Ararat. The ship’s dimensions resembled, but were somewhat larger than, those of the biblical ark. Another alleged aerial sighting occurred in 1960: a Turkish army pilot and a liaison officer reported seeing evidence of an enormous, rectangular barge on the southeast slope at about 13,000 feet altitude. During the 1950s Noah’s Ark expeditions from the West were considered a security threat by the Soviet government, whose territory bordered the region. Those who defied the Soviets’ displeasure found that the rugged environment made it difficult to sustain an expedition. Six to eight weeks of favorable weather were the most searchers could hope for as they tried to maneuver along the treacherous paths of the 16,000-foot mountain, where glaciers and deep pockets of snow have little time to thaw before the return of cold weather. In the 1980s the former NASA astronaut James Irwin participated in expeditions up the mountain, bringing much publicity to the search for the ark. He found only the remnants of abandoned skis. With the breakup of the former Soviet Union, expeditions up the mountain intensified during the 1990s. In 1992 Charles P. Aaron, who identified himself as the leader of an expedition searching for Noah’s Ark sponsored by the Tsirah Corporation, asked the CIA for assistance. It was Aaron’s understanding that the Agency had some imaging system that could penetrate ice several meters thick. Aaron stressed in his request that the operation underwritten by the Tsirah Corporation had been ongoing for several years and was supported by James Irwin and several American senators and congressmen. The CIA responded to Aaron’s request on January 21, 1993, by cryptically stating that an examination of the pictures that the Agency had taken of Ararat could not distinctly identify an ark. Conspiracy theorists interpreted this response to mean that the CIA had found something under the ice and snow of Ararat that had not yet been completely identified. Continued pressure produced a comment from the deputy director of the CIA’s Science and Technology Department, who said in his report of February 7, 1994, that the pictures of the remains on Ararat could not be identified as Noah’s Ark. The report concluded by stating that, at that time, no attempts would be made to organize additional research in the region of Ararat. 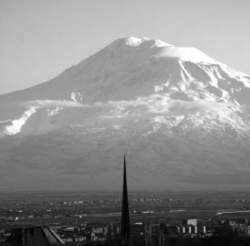 Ark researchers seized upon the CIA’s declaration of no “additional research” as clear indication that the Agency had conducted expeditions to Ararat in the past. In a follow-up response on February 16, the CIA stated that in order to make an exhaustive analysis of the pictures, all images made with different technical facilities during the past thirty years must be examined. When this exhaustive task had been completed, documents and photos would be declassified. Because the world still awaits a satisfying analysis of all photographs taken of the ark’s alleged remains, conspiracy theorists are certain that immediately after the end of World War II, the CIA began collecting evidence about the mysterious object hidden beneath the snow and ice on Ararat’s slope. According to this theory, a secret expedition sent to Turkey by the U.S. government found the remains of Noah’s Ark, quietly removed them from Ararat, and delivered them to a U.S. military base. For unknown reasons, perhaps linked to the shadow government and the New World Order, the CIA has not yet declassified the most important religious, scientific, and archaeological discovery of the century. 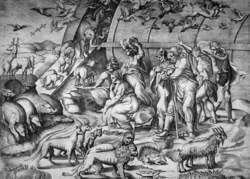 in biblical mythology, the ship on which Noah and his family and animals were saved from the great flood in order to repopulate the world. At the Children's Hospital, the gallant steed, the Noah's ark, yellow bird, and the officer in the Guards, were made as welcome as their child-owner. When I'm a man, I shall make a boat with a wooden house on the top of it, like Noah's ark, and keep plenty to eat in it,--rabbits and things,--all ready. By a bold poetical licence, most of these Noah's Arks had knockers on the doors; inconsistent appendages, perhaps, as suggestive of morning callers and a Postman, yet a pleasant finish to the outside of the building. Disability Services Minister Stephen Dawson has congratulated Activ for its commitment to re-establish Noah's Ark WA, and for providing certainty for young people with disability and their families. Franklin-Williamson Bi-County Health Department is seeking representatives from churches in Williamson and Franklin counties to learn about a free health/life-saving program through Operation Noah's Ark workshops. Status quo is being challenged, with creative power houses in the industry such as Insight, DDB Lagos, SO and U, Rosabell and Lowe Lintas, et al, being given a run for their money by relatively young agencies, such as Noah's Ark, X3M and the industry is being seen as the better for it. HUNDREDS of people gathered at Cardiff Bay Barrage to take part in the Noah's Ark Appeal's annual family fun walk. LOS ANGELES The Skirball Cultural Center's Noah's Ark exhibit opened in 2007, but it's still a tough ticket. The Story of Noah's Ark Helen Dardik Running Press c/o Perseus Book Group 250 W.